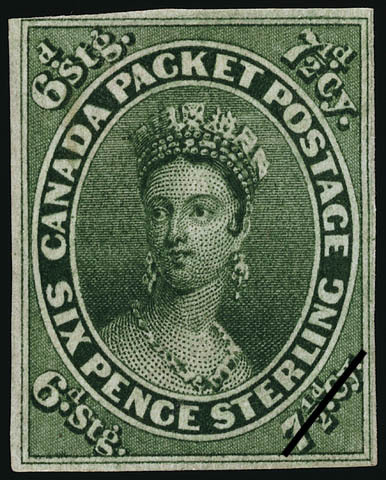 The value of a Queen Victoria - 6 pence 1857 stamp depends on several factors such as quality and wear, supply and demand, rarity, finish and more. Values in the section are based on the market, trends, auctions and recognized books, publications and catalogs. This section also includes information on errors and varieties and characteristics. This portrait of Queen Victoria was reproduced from a contemporary engraving of a full-length painting by Alfred Edward Chalon. Although this work of art portrays the young Queen in her robes of state, merely the head appears in various British colonial postage stamp designs. On the occasion of Queen Victoria's first visit to the House of Lords, she commissioned Mr. Chalon to paint this portrait as a gift to her mother, the Duchess of Kent. The memorable event was the prorogation of Parliament on July 17, 1837, the year of the Queen's accession to the throne.